Here are a few tips for parents from out Smile Town North Delta children’s dentist on how to handle baby’s first year of dental health. 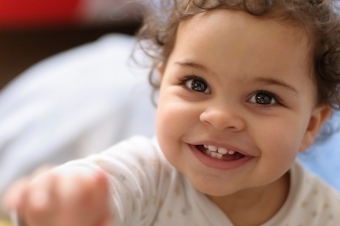 Baby teeth usually start to erupt when children are between six and nine months of age. These first teeth are very important, as they help your child eat and speak, and eventually guide the adult teeth into the proper. Baby teeth must be cleaned on a regular basis from the moment they start to erupt because infants can get cavities just like older children and adults. Clean your baby’s teeth and mouth after each feeding. If your baby’s teeth are not large enough for an infant toothbrush, you can simply use a piece of gauze or a wet facecloth to gently wipe teeth and gums. This not only keeps the mouth clean, it also prepares your baby early for what will become a lifelong habit. You should bring your child to the dentist for the first time by the age of one year, or around the time when the first teeth appear. Avoid sending your child to be with fluids other than water in their bottle, as drinks like juice and even milk can contain sugars that cause cavities. If your baby sleeps with a bottle, fill it with water. While brushing after feedings is ideal, if your baby often falls asleep during feeding, you can brush his or her teeth before feeding. If you have any questions about oral health care for babies, please feel free to contact our North Delta children’s dentists any time!